Decorate your study room and keeps your books vertically organized and make your room orderly in view. Not only keeps magazines, books, catalogs vertically organized,but also perfect for housing DVD's, video games, or CD's. Unique design, give you special journey in the ocean of books.Keeps books vertically organized and in place. Practical gift to book lovers and your children,teachers,friends or partner.Fits for any occasion. Handle with care! Heavy stuff may cause injury! High Notes design,simple and fashion,metal material,sturdy and durable. 4 black pads in the bottom to keep scratches in minimum and prevent slipping. 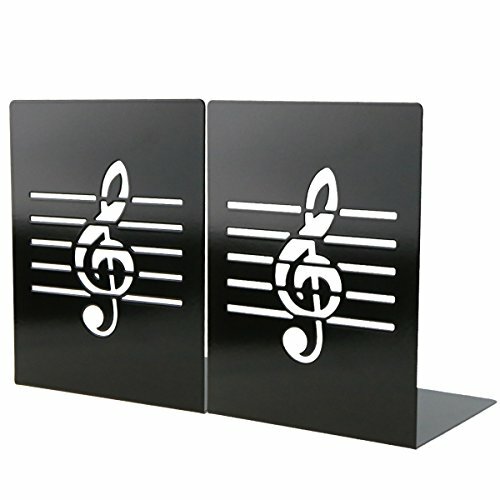 Music Style bookends,perfect gift choice for book lover and music lover. Unique gifts to kids/students/teenagers for any evens and festivals. If you have any questions about this product by Apol, contact us by completing and submitting the form below. If you are looking for a specif part number, please include it with your message.